In honor of this week’s annual Mermaid parade down Surf Avenue, hunt down a copy of this thoroughly original and engaging little movie displaying Coney Island in all its glory, as perfect an evocation of place as has ever been commited to film. Universally lauded and credited with inspiring both the nascent American indy movement and the French New Wave (by none other than Francois Truffaut), The Little Fugitive is a film suffused with raw charm and innocence, merging the blunt realism of a home movie with an arty sense of space and eye for telling detail. Saul Bellow wrote about The Little Fugitive that its visual style had the ability to "penetrate the hard surfaces of appearances, make the stones eloquent, cause subways and pavements to cry out to us, the millions of dead in clumsily marked rows to influence us." Francois Truffaut credited it with inspiring the French New Wave (it very clearly inspired Albert Lamorisse’s revered children’s film The Red Balloon, which came out three years later). Coming at a time when Hollywood artifice was at its peak, when back-alley street scenes were comprised of sets contructed on backlots (and look it), The Little Fugitive, with its cast of amateurs, and low-budget grit, was a stark and shocking slice of near-documentary realism. Groundbreaking in technique yet enagaging on the simplest levels, it concerns a day in the life of eight year old Joey, who, tricked by some neighborhood boys into believing he’s killed his older brother, runs away to Coney Island , where (his concern over his brother notwithstanding) he wanders the boardwalk, relishing his newfound freedom, through shifting and seemingly unlimited vistas of distraction and delight. We stay in Joey’s point of view throughout, experience each moment as he does, going where he goes. With the singlemindedness only a little kid can have, he spends a lot of time financing his boardwalk exploits by cashing in empty bottles he collects along the beach. Mostly eschewing dialogue for fragments of overheard conversation, the murmurous chaos of crowd sounds, the rumble of coasters and an off-kilter harmonica tune, the film achieves an almost meditative sense of calm admid Coney's nonstop swirl of vendors and barkers, sunbathers and swirling sand and garish neon, and the laughter and sherieks from the midway. With its themes of lostness, exile and alienation, and attention to the small and everyday, it has a slightly existentialist flavor. 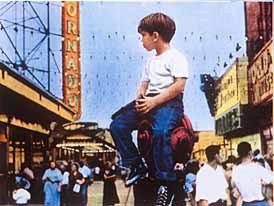 But The Little Fugitive is mostly about Joey's --and the viewer's-- interaction with his environment, about movement and invisibility, about being a part of and apart from the world in which it locates itself. The viewer has the eerie sense of passing unnoticed through conversations and jostling crowds, an effect achieved by Engels' pioneering use of an early form of Steadicam strapped to one shoulder; it allowed him to get shots from weird angles, keeping us in Joey's zigzagging point of view throughout. But mostly, in a film that captures it at a specific moment in time, we get a sense of Coney Island as a place both undeniably real and mythic. Indeed! At Tavel's urging, I was able to find a fifth generation copy of this splendid little film for the game theory enclave of my linguistics colloquium. And, because we are fearless (sic!) academics, we watched it through that prism. As Tavel suggests in her Neuroscape remarks, Engels carves out some new territory with his innovative deployment of the camera as a participant in the "game text" of the film. We were delighted and anticipate further fun, instructive viewings.